An experienced thief, equipped with the proper tools, can make away with your bike while you’re sitting in class, presenting at a meeting or even just picking up a sandwich. While a cordless angle driver will allow a thief to cut through almost any material, there are ways to protect yourself from having your ride stolen. To avoid walking outside to find your folding bicycle has now transferred into possession of an ethically challenged individual, purchase a folding bike lock. Before we begin to outline the best products available to secure your folding bike, it is important to note that collapsible bicycles are inherently easier to protect from theft. The capacity to fold your two-wheeled vehicle and bring it inside buildings means fewer opportunities for a would-be bicycle thief to happen across your ride left unattended. With that being said, there are still times when a lock is necessary to protect your bike from sticky-fingered members of society. The next question is, which folding bike lock is right for me? If you are an avid cyclist, then you are probably no stranger to the products of Blackburn Design. Their San Quentin model “shackle style” bike lock is one of the best available options to ward of potential thieves. Complete with an anti-scratch liner to prevent scuffing, this is a well-designed product in every way. At $65 the San Quentin is an affordable option that comes with a theft-replacement promise up to $4000. Abus, a German security company, makes the perfect lock for those concerned with making efficient use of the room in their bag. Made of 5.5mm hardened steel bars, this lock can fold into an easy to carry, compact form. The main drawback to this option for securing your bike is its price tag: a whopping $145, however, this folding bike lock is a unique, effective way to secure your property. At the end of the day, experts assert that massive chains are the best way to deter thieves. With a 14mm link titanium reinforced chain, the Beast presents a daunting obstacle to a thief. 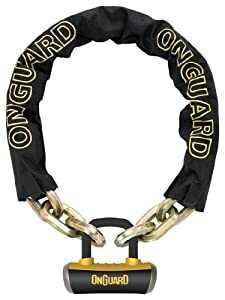 Complete with a short-shackle u-lock, On Guard makes a product that warrants its $114 price, and I am sure you can think of another use for that chain if you find yourself in a confrontation with someone eying your bike. That being said, this monster of a lock does weigh almost ten pounds, so if traveling light is your goal, the Beast might not be your best option. If you are looking for a chain lock that won’t totally weigh you down, the Kryptonite New York chain is a lighter option. At about six pounds, this folding bike lock, though far from featherweight, is far more manageable than On Guard’s Beast model. The Kryptonite chain will also weigh less heavily on your wallet, costing only $80.